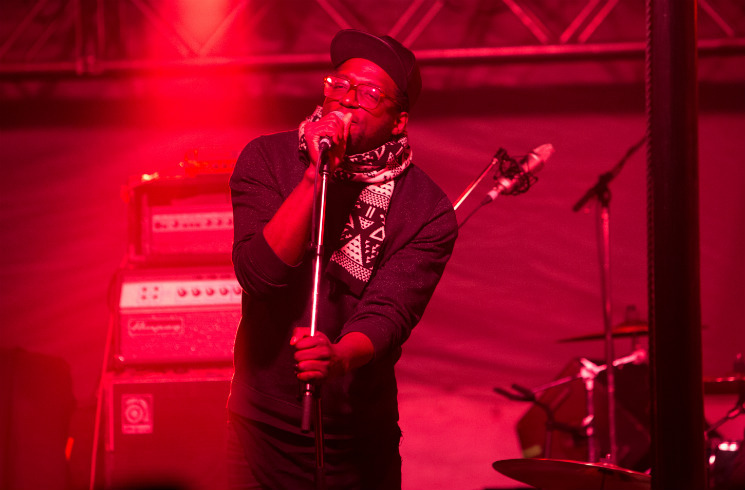 Grand Analog brought summer to a cold night in Elora. It's impossible not to like this hip-hop group when they're on stage jumping around, with frontman Odario Williams getting the crowd hyped. The performance was one of non-stop action — there was so much energy and talent on one stage that the audience was half-expecting Ice Jam's tent to collapse. With roots in Winnipeg and Toronto, Grand Analog are a unique collective that fuses dub, rock, soul, hip-hop, jazz and funk into one brilliantly chaotic blend that resulted in a spontaneous, lively performance. Crowd favourites included "Howl (Like Wolves)" and "Lion Head" (Odario Williams got the crowd shouting "It's been a long long time!") from their most recent album, Modern Thunder. At one point, Williams "took a walk on the wild side" with his kazoo while performing "I Play My Kazoo" from 2009's Metropolis Is Burning. A notable mention goes to Ofield Williams, who propelled the group's show forward with rich sax solos.